To properly diagnose your condition, it is essential to view and evaluate the underlying structures. The skeletal system is the foundation of mechanical joint function. 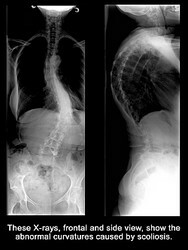 There may be distortions, degenerative changes, scoliosis or other conditions that influence the diagnosis and thus the treatment. Skeletal x-rays reveal important information for mechanical treatment technique. We use this information to formulate your complete care program. A normal spine has a set of specific normal curves. The neck x-ray on the left shows an abnormal "reversed" neck curvature or kyphotic curve. The x-ray below restoration of proper neck curves. In addition, to curves, there is a plethora of degenerative joint changes that can infiltrate the spine and influence the diagnosis and treatment. Patients who "think" they don't need x-rays, MRI's or Cat Scans are compromising their diagnosis and the quality of their care. NOTE: The films below reveal a before and after treatment program that was effective in restoring the normal cervical curve. The MRI is a magnetic scan (non-x-ray) that can view the disc and nerve. This enables us to see the extent of the damge and determine a more accurate treatment plan. The MRI to the left reveals a bulging-herniated disc that is puishing into the spinal cord. The Cat Scan is another way of looking at the spine using x-ray. It can reveal a more detailed image than x-ray. The cat scan to the right is pointing to a herniated disc that is pressing onto the spinal cord. This is a cross section top down view of the spine.